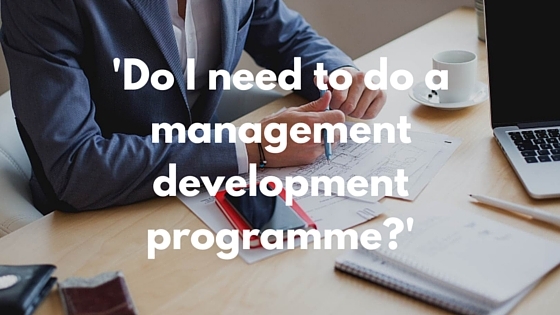 “Do I need to do a management development programme?” It doesn’t sound like a particularly difficult question but for some managers admitting they are struggling in their role is tantamount to admitting failure, or that their admission will be perceived as a sign of weakness. In reality it is neither. Mike Gaffney explains why looking for help in the form of a management development programme is a clear sign of strength not weakness. Keeping it simple, what’s needed is an open and honest discussion between the manager and the boss. Very few senior managers or employers would respond negatively to such a request, because first of all the individual is showing huge commitment to the company but also to changing themselves in order to improve their performance. If you have somebody of that mind-set, they are valuable and you want to keep them and tap into more of their potential. They have had the courage to come to you and put their case to you. From the boss’s perspective, this is someone who wants to develop and contribute more so they should be willing to make that happen. The return on investment in getting managers performing to a high standard is very substantial. By having that conversation with your boss, you invite open and honest discussion and get their perspective which helps to lock them into a commitment. It is not a sign of weakness to go to your boss and admit that you are struggling in the role and that you need help. On the contrary it is a sign of strength. When you make yourself vulnerable and challenge yourself you will often find the world responds by saying “fair play, you are giving it your best shot.” You might assume that people see it as weakness when really the world sees it as courageous. We don’t like being vulnerable because it’s an uncertain feeling and we don’t like uncertainty, but others often see it differently; they see it as a sign of strength. With the economy improving we are finding more and more employers asking the question, “how do we retain our best people?” Well, one way is to provide them with all the support they need. So managers should ask for the support that will make a difference to you and your organisation.